TORONTO, ON – Henderson Brewing has announced details of latest in its monthly Ides Series of limited edition beers, with this month’s release paying tribute to a classic Canadian company. O-Pee-Chee Lager (5% abv) is named after the O-Pee-Chee Gum Company which was best known for its popular trading card series, most notably hockey cards. 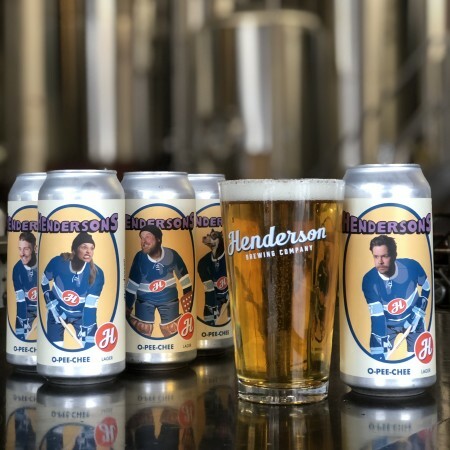 Described as being “light, bright, crisp, and refreshing,” O-Pee-Chee Lager is available starting today (January 18th) at the brewery, where it will be on tap and in 473 ml cans with a set of 21 different labels featuring pictures of Henderson employees designed to look like classic hockey cards. To celebrate the launch, samples of the new beer will be served at 6:00 PM along with free hot dogs, and Flip Collectibles will be on hand from 6:00 to 9:00 PM with a pop-up shop selling vintage trading cards and other memorabilia.